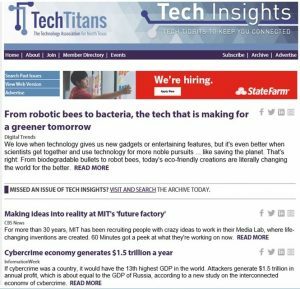 To receive a weekly newsletter of technical articles compiled from sources local to international, sign up for Tech Insights here. Click here to download a PDF copy of the Tech Titans annual report 2018. Tech Titans began 2018 by setting aggressive targets reflecting the priorities and interests of our members who represent a quarter of a million employees through our 300+ member companies. Our targets include innovation, advocacy, programs, networking and educational events. We reviewed what programs were of most interest to our members and, as a result, established two new forums – one on artificial intelligence and one on blockchain. To drive innovation in North Texas, we began to explore the establishment of a Dallas-based innovation hub for entrepreneurs, major corporations and university researchers — those who embrace, nurture and leverage technological innovation. 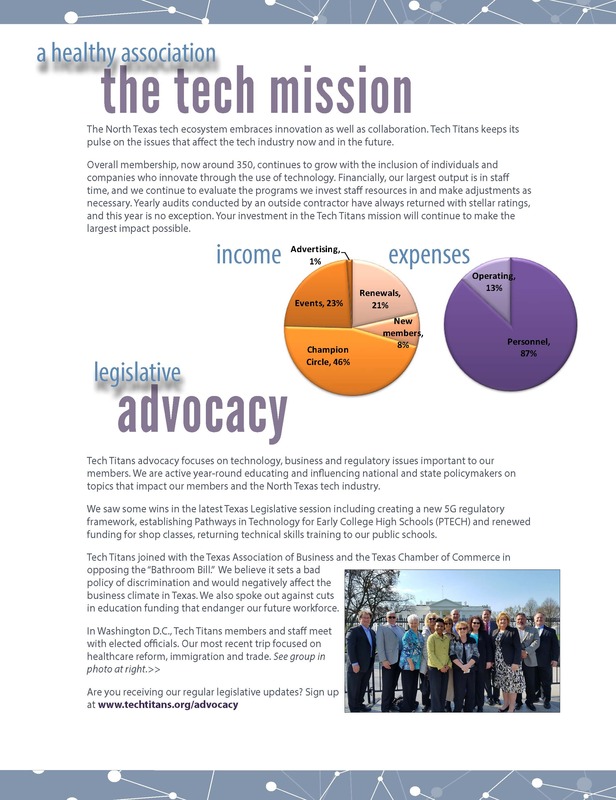 Our advocacy program focused its efforts on the Texas legislators’ interim charges, collaborating with other associations to promote tech policy at a federal level, a Tech Titans fly-in week in Washington, D.C., and meetings with federal and state legislators. In order to engage the next generation of Tech Titans, we looked at our active volunteers and membership and decided to kick off our NextGen events this summer. Finally, one of our most successful programs is our STEM education initiative, which focuses on meeting the tech workforce demands of the future. Congratulations to the STEM team that is well on its way to this year’s target of producing inspirational STEM experiences for 5,000 students in the North Texas area. All this could not be achieved without the passion and energy from all of you, our members, committee volunteers, speakers, board members and staff. Tech Titans is the largest technology trade association in Texas, and we will celebrate the finalists and winners at our prestigious annual Tech Titans Awards Gala on August 24. The Gala will honor the leaders, inventors, adopters, advocates and educators, from all sizes of organizations. We have received the highest quality of inspirational nominations for this year. What a great way to celebrate and recognize our innovative contributions to the North Texas technology ecosystem! Tech Titans is the largest technology trade association in Texas, representing a quarter million employees through its 300 member companies. More information about Tech Titans and its annual Tech Titans awards gala can be found online by visiting www.techtitans.org.